Store Credit & Refund Extension covers and automates most of your store activities, related to Credits and Refunds of customers. This is a simple, but an incredibly powerful solution thet allows you to get more loyal and satisfied clients. Turn returns and exchanges into Credits and save your time and money! Simply the most powerful solution for Credits & Refunds! 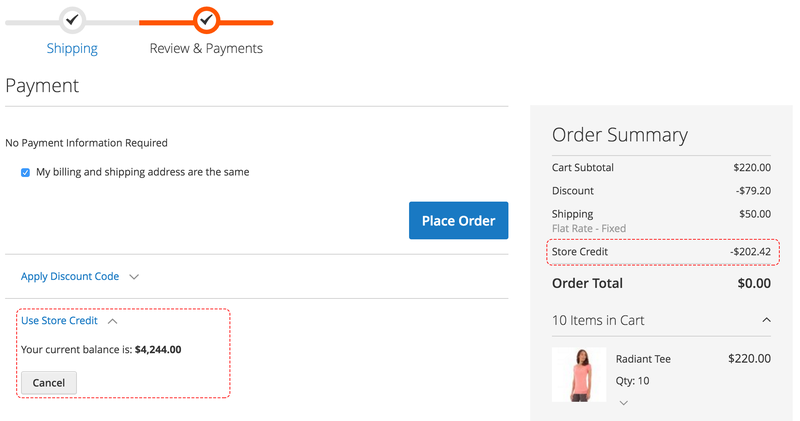 Magento 2 Store Credit & Refund Extension gives you an opportunity to make your customers more satisfied, and, therefore, receive more orders in your online shop. Our solution lets you convert customer returns into store Credits. For example, a customer wants to return the items he/she bought and receive money back. This process can take some time: your employee should spend some time to register the refund, then a customer should wait for some (usually undefined) time to get their money back, pay transaction commission, etc. So, everybody loses in this situation. But time is money! 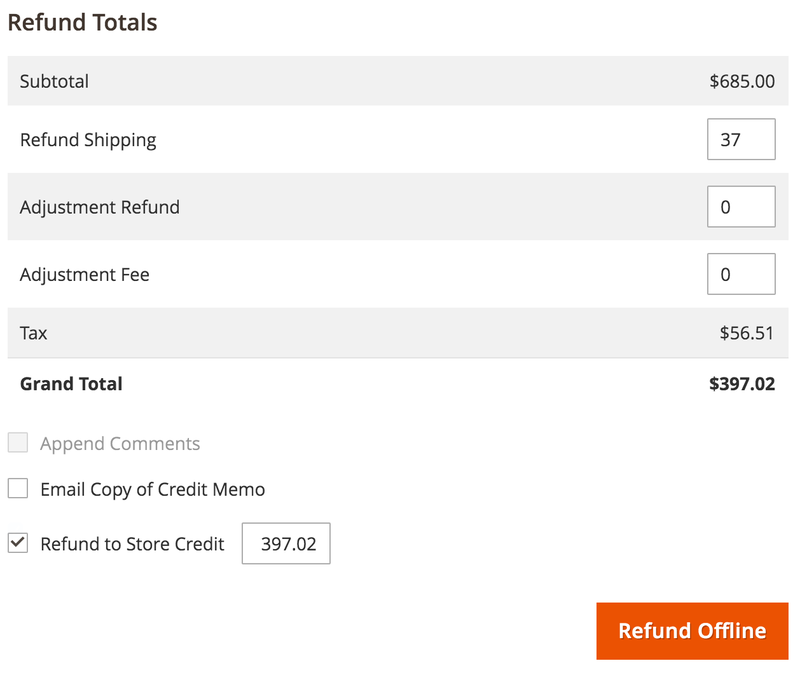 Use Magento 2 Store Credit & Refund Extension and open a Credit program for your store! With our solution you get an option to turn all returns or exchanges into Credits within seconds and save your company money. For example, your customer wants money refunded and you are able to deposit that money into the customer’s account from your store! Fast, easy, brilliant! Satisfied customer may use their credit to pay for the next purchase. One of the most outstanding extension features is that you can give the customer any amount of Credit (as a gift, for example), and he/she can use all credit at one time. So, if a client makes a purchase for $100 and they have $100 Credit they, therefore, are able to use their credit to pay for the order! All credits will be debited in just one click! Launch Credit programs for your online shop using Store Credit & Refund Extension! Launch Credit programs for your store and make your store stand out among competitors. Save your time and money by skipping several steps in the process of money refund. Convert returns into new purchase processes using our solution. Get an intuitive customer interface and a simple interface for administration. Keep returning customers satisfied with our extension by saving their time and money. Showing care for your customers by saving their time. Use the extension during an exchange process. Customers can pay the price difference using their credit account in your store. Appreciate your customers giving by them thank-you Credits. Give your customers the freedom to manage their returns and exchanges using our extensions RMA + Store Credit & Refund! Your customer can check their Credit Transactions history in the Store Credit menu in their personal account. Every transaction, either debit or credit is displayed with short comments to remind them of details. Customers also can receive email notification about credit transactions, in case they subscribe. Every customer can use credits to pay for purchases. If a customer has some credit in their Store Credit account, the credit amount can be taken off during checkout. All the customer needs to do is just click “Use Store Credit”! The full amount of credit will be debited at once. Therefore, the Total of the current purchase will be reduced (including all taxes and shipping fees). You can reward, appreciate or even offer an apology to your customers using our Store Credit & Refund solutions. 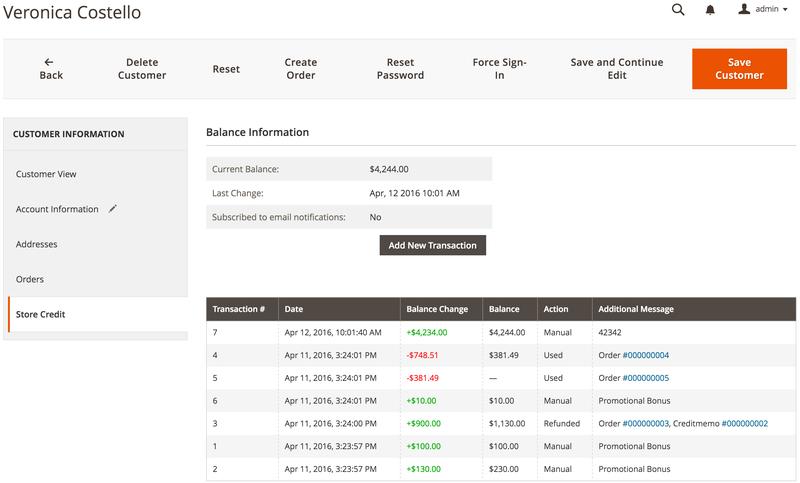 A simple back-end interface allows you to manually add new credit transactions whenever you need it. For example, you created a lottery or contest in your store. So, there are some winners which you have to reward. Simply add a new transaction in the back-end and give the winners their gift certificates represented in credits. Satisfied customers bring more sales! 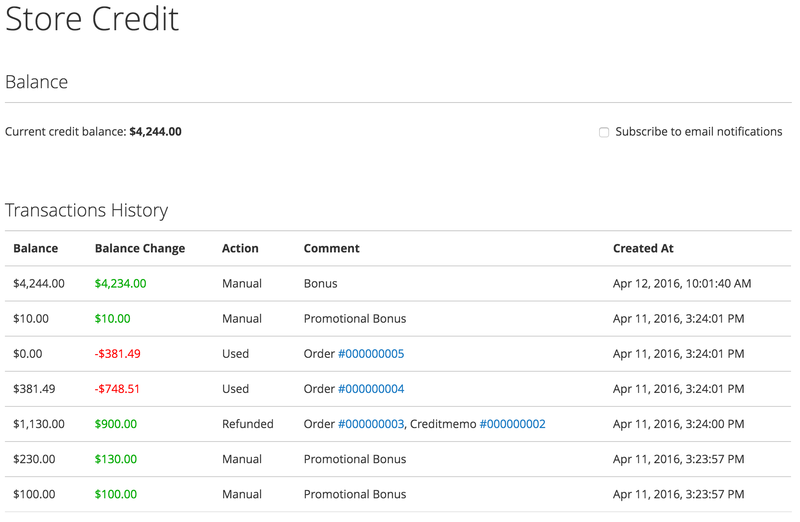 Store Credit Magento extension allows you (as a store administrator) to set the amount of credit to refund to Store Credit right in the Credit Memo. For example, a customer made a purchase for $500. Then, he wanted to return all items and get their money back. Our solution provides you with the option of a partial refund to Store Credit: creating a Credit Memo you can refund the desired amount to the customer’s store credit, if you agreed so. Besides, it is very convenient to discuss any transaction changes in the interface of our extension's RMA (Return Merchandise Authorization) or Helpdesk. The Store Credit & Refund extension allows your customers to add funds to their Store Credit Account. This awesome feature lets your store's returning clients save their time and money by purchasing Credit ahead. For example, a customer purchases some Credit. Then they search for some items in your store, but then decide to come back a bit later to order. But! They already have money for their future order in the Store Credit. So the next time, this customer saves some time during checkout using the Credits directly from their account. Take care of your customers and save their time and money with Store Credit! Store Credit & Refund Extension gives you a Enterprise set of flexible options for editing every customer’s card. Store Credit & Refund solution allows your customers to send any amount of credit he owns to a friend. Another client-oriented feature. Easy to use, work like a charm! As always, Mirasvit gives us peace of mind when coming to features and stability. We use it as the wallet in our marketplace to offer customers to keep and use their store credit. great extension great support and features. So far all works very well. Sort out the issues with Refunds and credits easily. Another great extension from these guys. Works as it should. Their extension always work great out of the box. Works as it should when you refund the customer which some other companies that make this extension doesn’t do so well with. Thanks! We are based in New Zealand and purchased couple of extensions from these guys. So many great reasons to purchase any extensions from them. We will buy more extensions from Mirasvit. 100% recommended. We extended our return policy to more days, but after 14 they could only get store credit, combined with the plugin RMA from them, it's a piece of take. What took us 10 minutes per order before, we spend 1/6 of the time now. Great extension. but wish there was a way to delete credits or modify amounts of credits issued. Some issues with the tax calculation. But that was quickly fix by Mirasvit Team. Nothing can beat Mirasvit - simply the best. The whole refund process got much easier and simpler thanks to this extension! Awesome Features along with outstanding Customer Service! What can be felt, not always can be expressed in words, but I will try my best! 1. I bought almost all existing extensions for M2, while offered a very generous discount from a Sales Rep. Then, as all of us know, all the miracles stop right there, but not with these guys. 2. Installed the extensions, and as it usually happens, problems did not wait so long to arise on my horizon. 3. No fear, help is near... that is my personal Slogan... and found out the same attitude from Mirasvit guys. I asked for help, and it was near. I reported PHP7 and other compatibility issues, and a fix was ready in a blink of an eye. I asked for features improvements and suggested new features, and these came in a matter of a few days. 4. Features pack on the extensions is very reach, and these guys are always open to any sound improvements on their extensions. 5. Extensions updates are done via composer, so no manual uploads and unzips on every update release. That makes all my updates as easy like a snap of a finger,.. 10 seconds and I am all set. P.S. In the end of the day I feel happy to be a respected customer of Mirasvit. I am hooked on this valuable M2 Solutions Provider. My $$$ spent on the extensions are secure... I feel like a part of the Team. I highly recommend Mirasvit to anyone who is seeking peace of mind and stable future for his/her Online Business. Magento 1: Great Solution For Saving The Sale! We get a lot of returns in our industry.. Needed a fix for saving sales and better managing exchanges. This was a perfect fit. This allows us to have the leverage over clients by providing store credit instead of refund, keeping the money in our account is what it is all about:-)@!!! ...missing in Magento CE that kept it from being perfect - with the Store Credit Extension it really is. Thank you guys! great extension that covers a lot of scenarios. Had some compatibility issue with Rewards extension. Support team was able to resolve it quickly. The extension is very easy to use. 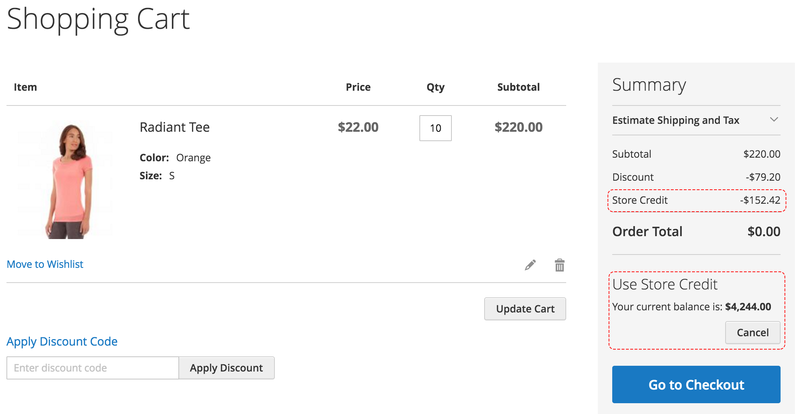 Great extension that fills a gap in Magento's CE functionality. Issue "unable to create invoice for refill product"
Issue when "Partial credits do not applied to invoice discount"
Error "Table 'credit_transaction' does not exist ..."
Issue when "Invoice grand total differ from order grand total"
Error "Call to a member function getStoreId() on null in Model/Quote/Item/AbstractItem.php"
Error "Fatal error: Method Magento\Ui\TemplateEngine\Xhtml\Result::__toString() must not throw an ..."
Issue "Invalid type for value: .... Expected Type: "float"." Added option "Share customer balances"
Creditmemo partial return with "Do not refund applied Store Credit"
Added option "Enable Refund To Store Credit (default value for credit memo)"
SCR2-53 - Fixed "Current balance is used in each order in multishipping"
Ability to force email in "Send Credit to Friend"